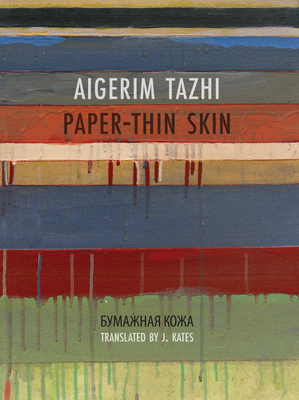 Paper-thin Skin is the debut collection by Aigerim Tazhi, who has broken ground as a Kazakhstani woman poet by gaining attention both in Russia and internationally. Fish, insects, birds, the sea, the sky, humans seeking connection, and death figure frequently in these succinct poems, as do windows, mirrors, and eyes: these are poems of observation and deep reflection. Tazhi gently insists that we look at words and the world "in the eye," as she seeks to create what translator J. Kates calls a "mystic community of communication. Aigerim Tazhi was born in the western Kazakhstani city of Aktobe (formerly called Aktyubinsk) in 1981. She is a graduate of the Aktyubinsk (Zhubanov) State University. Her debut book of poetry, "BOG-O-SLOV" ("THEO-LOG-IAN," but a play on words could make it "GOD O' WORDS"), was published in 2003. She has received numerous literary prizes in Kazakhstan and Russia for poems in the collection, and in 2011 she was a finalist for the Russian Debut Prize in poetry. Her work has been translated into English, French, and Armenian, and published in prominent literary magazines. Tazhi was one of the creators of a project of literary installations, "The Visible Poetry," in 2009. She lives in Almaty, Kazakhstan.